There are literally hundreds of different types of glue on the market such as water based (PVA) and polyurethane glues for woodworking, epoxy glues for composite work and a host of others including contact cement and cyanoacrylates (Crazy glue). There are 4 glues commonly used for making skateboards and this list is to help you choose the right glue for your production needs. How much clamping pressure, how to apply glue, and how much glue is also discussed here. Titebond III is the best glue that I have found for small production board builders. 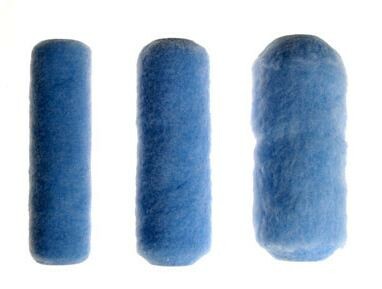 It is waterproof, has a long open (working) time and remains flexible when dry. Before buying or contacting a glue manufacturer you need to look at the number of decks you produce. 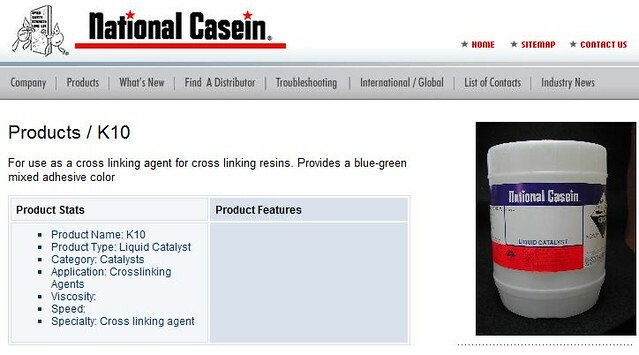 If you are an independent builder making and selling boards (a dozen or so a month) you probably will not want to contact National Casein about purchasing a drum of their glue. They do not sell it in small enough quantities. This type of glue also needs a heat or microwave source to cure. If you are a manufacturer with an established client base and have the proper presses, the National Casein glues will work perfectly for you. If not there are other choices. If you are into production but not a factory, Franklin sells a glue called SK8. It is intended for small to medium manufacturing. This glue has a shelf life of only 3 months and will start to gel if not used. It is only sold in 5 gallon+ pails so make sure you are going to use it immediately after purchasing. This is a great glue for anyone producing an ongoing supply of boards to an established client base. 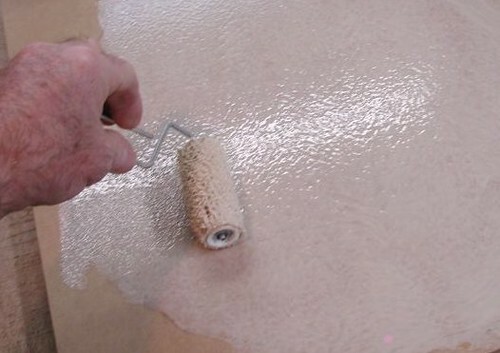 Some epoxies are formulated specifically for laminating wood. One of the drawbacks of epoxy for independent builders is that it is more expensive than off-the-shelf water-based glues. There are however applications where it works very well but you have to weigh in the expense factor. Epoxy will produce a stiffer laminate and not swell the wood like water-based glues will. Depending on the catalyst you choose, epoxy will have a longer wet time than water-based glues. Another drawback with epoxy is that the roller becomes a throwaway as it cannot be reused like with water-based glue layups. Epoxy should be used in a well ventilated area, rubber gloves and a canister type respirator should be used at all times. 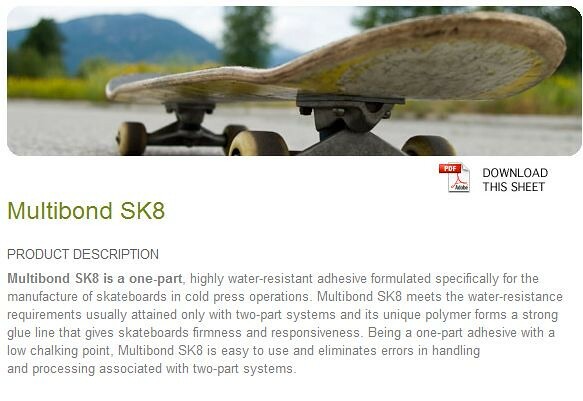 Here are a couple of companies that sell epoxies suitable for laminating skateboards. I highly recommend Titebond III (made by Franklin) for making skateboards for a number of reasons. 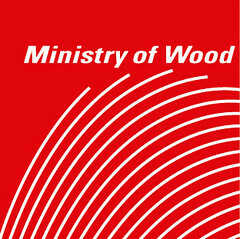 It has a longer wet time than with most woodworking glues, nine minutes as opposed to four or five. This gives you the much needed working time to get all the layers glued before it starts to set. 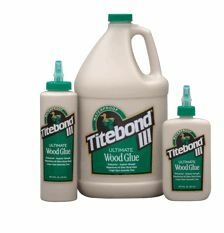 Titebond III is also waterproof and has a flexible glue line when dry, both very important to board building. Another great thing about Titebond III is that it can be purchased locally (it is sometimes difficult to find in Canada, especially in the gallon jugs). In the USA it can be purchased at most big box building stores as well as woodworking tool suppliers at a reasonable price if you shop around. We found it at a Lowe’s in Maui for $23.96, that’s cheaper than we can buy it wholesale in Canada! Why do glue manufacturers ask for 250 psi? This is a frequently asked question and the answer depends on the process, size and number of layers in a board. If you are making a custom board using rectangles of veneer I highly recommend using a thin napped roller (left, below) for all builds. The thicker the napp, the more glue it absorbs, which you don’t want. The size (length) of the roller will depend on the size of your board and how many boards you will be making. If you are just making one board I recommend a 4″ long thin napped roller. The smaller (shorter) the roller the less glue it takes to charge it. Glue is expensive and it is easy to waste. Depending on the number of layers in your deck you may want to have two rollers on the go. The quicker you can get glue on all the layers and into the vacuum bag, the better. An even coat of glue is important, especially when using 1/16″ Canadian Maple veneer. Any excess build up of glue in one area will result in bubbling. Bubbling is where excess water from too much glue gets absorbed by the maple and causes rapid expansion in one area. Because of this I recommend not using a squeegee to apply glue. If you are building a custom board I recommend applying glue onto both mating surfaces. * Apply a light coat on one surface, to raise the grain and a heavier coat on the other. Make sure there are no dry spots. Once you have applied the glue immediately stack the two layers on top of one another. This will slow the drying process. Do not do a glue up in direct sunlight or where there is a breeze from wind or an air conditioner. Both will cause the glue to set prematurely and will cause delamination. Here is a video showing the proper amount of glue needed for a strong lamination. Water based glues actually soften the maple veneer. If you want radical bends I recommend always using water-based glue instead of epoxy. A trick I have learned for making extreme bends is to lightly wet the outside layers of your veneer stack before placing it into the vacuum bag. This will soften the outer layers and help to prevent the wood from breaking. *Our pre-made deck kits come with instructions that indicate to only put glue on one of the mating surfaces. When building with these kits please follow the instructions included in your kit. Your website is phenomenal!! It’s like a college course on board making. Completely informative and well thought out. I own a furniture shop and would like to make boards, what is the most economical amount of plywood i should buy for making enough boards to keep me and my friends skating? Obviously a pallet or 1 ton of wood is cheaper, yet i will not need that much at first, or is it good to get alot of wood and just sit on it? I am building a concrete mold for pressing deck and I’d like to know what you recommend as a barrier between the concrete and the face layer of the veneers, top and bottom. I’ve heard 1/8″ cork is good but maybe you have another recommendation? Thanks. Lowe’s sells large heavy duty packing boxes that can be cut to size. The cardboard is about 1/4 inch and is much cheaper than buying (even finding) cork. My boards come out with no imperfections.